BBC Sport outlines the battles for promotion and relegation - and the race for European qualification - in England and Scotland. Manchester City won the Premier League title on 15 April as Manchester United lost 1-0 to West Brom. The teams finishing second, third and fourth - Manchester United, Tottenham Hotspur and Liverpool respectively - have joined them in qualifying for the Champions League, with all four teams entering at the group stage. 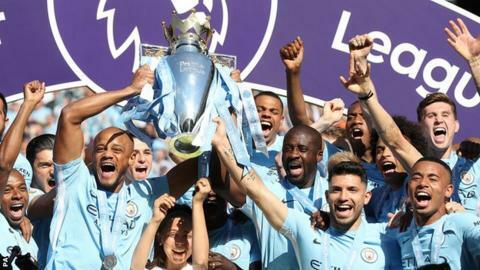 Because FA Cup winners Chelsea and EFL Cup winners Manchester City have already qualified for Europe through their league position, the fifth, sixth and seventh-placed clubs all qualified for the Europa League. Fifth-placed Chelsea and sixth-placed Arsenal will enter at the group stage, with seventh-placed Burnley joining in the second qualifying round. The bottom three teams are relegated to the Championship. Stoke City's 10-year spell in the top flight came to an end after a 2-1 home defeat by Crystal Palace on 5 May, while West Bromwich Albion joined them on 8 May after Southampton's 1-0 win at Swansea. Swansea City's relegation was confirmed with a 2-1 defeat by Stoke on the final day. Wolves sealed promotion to the Premier League on 14 April without kicking a ball when rivals Fulham were held to a draw, and they clinched the title by beating Bolton 4-0 a week later. They will be joined in the top flight by Cardiff City, who secured second place with a 0-0 draw with Reading on the final day of the regular season, and play-off winners Fulham. The bottom three teams are relegated to League One. Sunderland's relegation was confirmed by their 2-1 defeat by Burton on 21 April, while Barnsley and Burton Albion went down on the final day of the season. Wigan Athletic were promoted to the Championship after their 4-0 win over Fleetwood on 21 April, sealing the League One title by beating Doncaster 1-0 on 5 May. They will be joined by Blackburn Rovers, who sealed promotion by winning 1-0 at Doncaster on 24 April, and Rotherham United who beat Shrewsbury in the play-off final. The bottom four teams are relegated to League Two. Bury were the first Football League team to suffer this fate after a 3-2 home defeat by Northampton on 14 April. Milton Keynes Dons joined them on 28 April after losing 2-0 to Scunthorpe. Northampton Town and Oldham Athletic were both relegated after their 2-2 draw at Sixfields on the final day of the season. Accrington Stanley were promoted to League One by beating Yeovil 2-0 on 17 April and clinched the title on 28 April with a 1-0 win over Lincoln. Also promoted are Luton Town, who drew with Carlisle on 21 April,Wycombe Wanderers who made sure by winning 2-1 at Chesterfield a week later, and Coventry City who beat Exeter 3-1 in the play-off final. The bottom two teams are relegated to the National League. Chesterfield's fate was sealed on 24 April after Morecambe drew 0-0 with Cambridge, while Barnet went down despite beating the Spireites 3-0 on 5 May. Macclesfield Town have been promoted to the English Football League, having clinched the National League title with a 2-0 win at Eastleigh on 21 April. Tranmere Rovers beat Boreham Wood in the play-off final on 12 May to take the second promotion place. The bottom four teams are relegated, and will replaced by the champions and play-off winners of the National League North and South divisions. Chester were the first team in England's top five divisions to be relegated when they lost 2-0 to Tranmere on 7 April, while Guiseley joined them after losing 1-0 at home to Barrow on 17 April. Torquay United were the third team relegated after their 1-1 draw with Hartlepool on 21 April, and Woking completed the quartet after losing 2-1 to Dover on the final day of the season. Salford City clinched the National League North title on 21 April, while Havant & Waterlooville secured the National League South title on the final day of the season. Meanwhile, Harrogate Town and Braintree Town won the North and South play-offs respectively to secure promotion. Celtic clinched the title, and a place in the Champions League first qualifying round, by beating Rangers 5-0 on 29 April. Because they also won the Scottish Cup, the Cup's Europa League place reverts to the fourth-placed league side. Second-placed Aberdeen will enter the Europa League at the second qualifying round. Third-placed Rangers and fourth-placed Hibernian enter in the first qualifying round. Bottom side Ross County were relegated to the Championship on 12 May after drawing 1-1 at St Johnstone, while 11th-placed Partick Thistle joined them on 20 May after losing to Championship side Livingston in the play-off final. St Mirren were promoted to the Premiership as champions after avoiding defeat by Livingston on 14 April, while runners-up Livingston were promoted on 20 May after beating Premiership side Partick in the play-off final. Bottom club Brechin City, without a win all season, had their relegation to League One confirmed on 24 March. Ninth-placed Dumbarton were relegated on 13 May after losing their play-off final to League One side Alloa. Ayr United were promoted to the Championship as League One champions after beating Albion Rovers 2-0 on the final day of the season - a result which also confirmed Albion's relegation. Alloa Athletic were promoted via the play-offs on 13 May. Bottom club Albion Rovers will be relegated to League Two, while ninth-placed Queen's Park joined them on 5 May after losing to Stenhousemuir in the play-off semi-finals. Montrose were promoted to League One as League Two champions after drawing 1-1 with Elgin on the final day of the season. Stenhousemuir beat Peterhead in the two-legged play-off final to win promotion on 12 May. Bottom club Cowdenbeath defeated Highland League champions Cove Rangers over two legs for the final place in next season's League Two, after Cove beat Lowland League champions Spartans in their play-off. Who needs what to qualify for Europe? How do fans get through a whole season without a league victory? Read more on How do fans get through a whole season without a league victory? What do Uefa changes mean for Scots? Read more on What do Champions League & Europa League changes mean for Scottish sides?